1. Process pecans in a food processor until finely chopped. 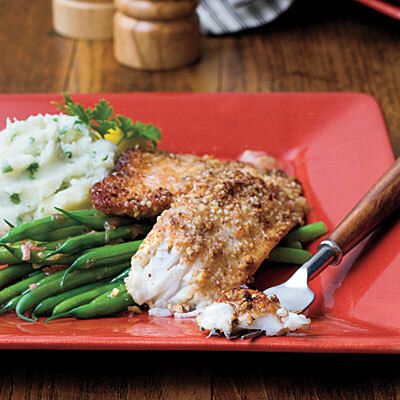 Sprinkle fish fillets with salt, garlic powder, and pepper. Dredge fish in finely chopped pecans. 2. Melt butter in a large nonstick skillet over medium-high heat; add fish, and cook 3 to 4 minutes on each side or until well browned and fish flakes with a fork. Serve with Golden Rum-Butter Sauce. Garnish, if desired.